While I want to weld up a proper offroad trailer myself, I needed something a little more immediate. 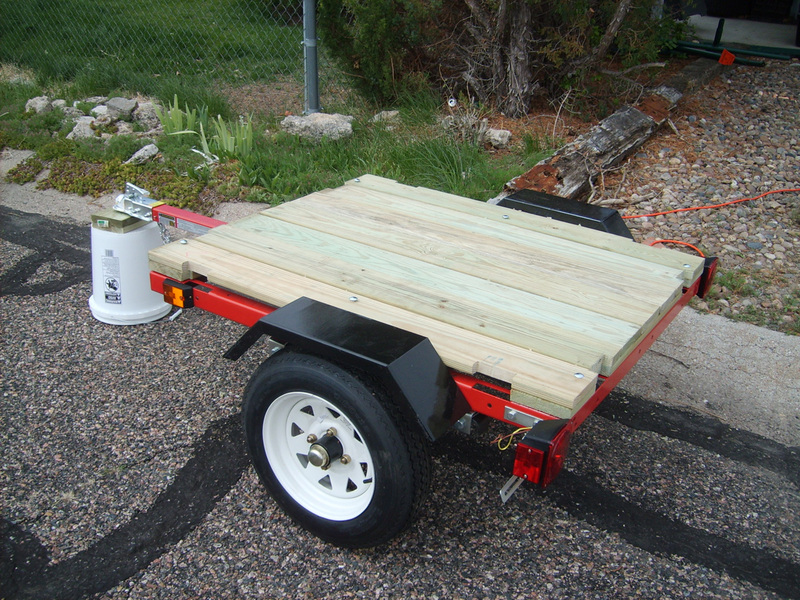 I ordered a 1090lb Harbor Freight 40"x48" trailer last week, primarily for a road trip I have coming up in June. Including shipping, the trailer cost me $186. My '95 Grand Cherokee has decent capacity if I'm on my own, but when other people and their things are in the Jeep with me, it gets kind of cramped. I learned that last year. I'll be driving to northern Missouri to pick up my mom, then on to western Kentucky to pick up my son, camping two nights on the way back here to western Nebraska, about 2300 miles in all. So Harbor Freight it is. I'm hoping to take my Lab with me, so all of the camping gear will get put in the trailer. The trailer came in Monday. I got the frame put together that night and the axle mounted the next day. I read several posts about people complaining about the nuts and bolts, stress fractures and fenders falling off. To begin with, I used Loctite on every bolt, but I'm thinking I may replace all of the hardware later on. Friday morning, I moved the trailer from the carport I was building it under, backed it up right into a post, breaking one of the lenses. I haven't even hooked it up to the Jeep yet. Fortunately, the lights are standard trailer lights and I was able to get a replacement lens for under $3. And, as a bare frame, the thing seems really flexible. I'm hoping after it has a floor, it's a little more rigid. 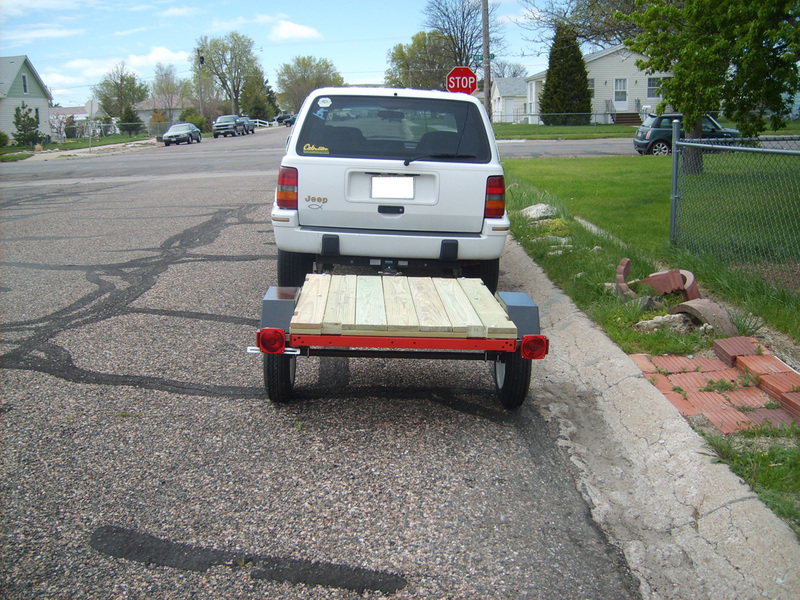 I went to HomeDepot this morning and bought pressure treated 5/4" deck boards to build the floor and walls of the trailer. The boards, deck screws and angle brackets for the walls cost me $103. All of the things I'm planning to add to the trailer will cost me quite a bit more than what I spent on the trailer to begin with. 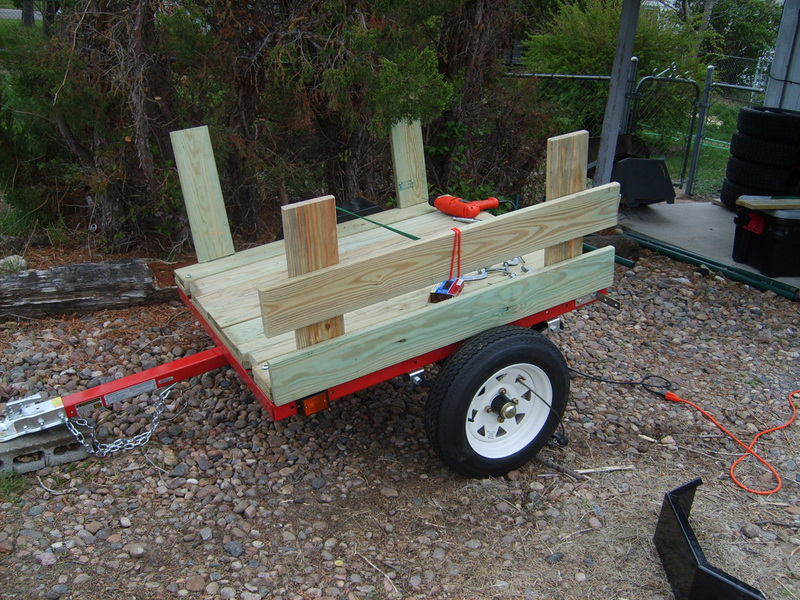 I hooked it up to the Jeep was I was building the floor and I've got to say that the Jeep dwarfs the trailer. The thing just looks tiny behind it. I'll take pictures of the trailer tomorrow. The floor is seven 5/4" x 6" (5.625) x 48" boards on top of three lateral boards. I screwed the boards together from below so that I don't have screws visible from the top. 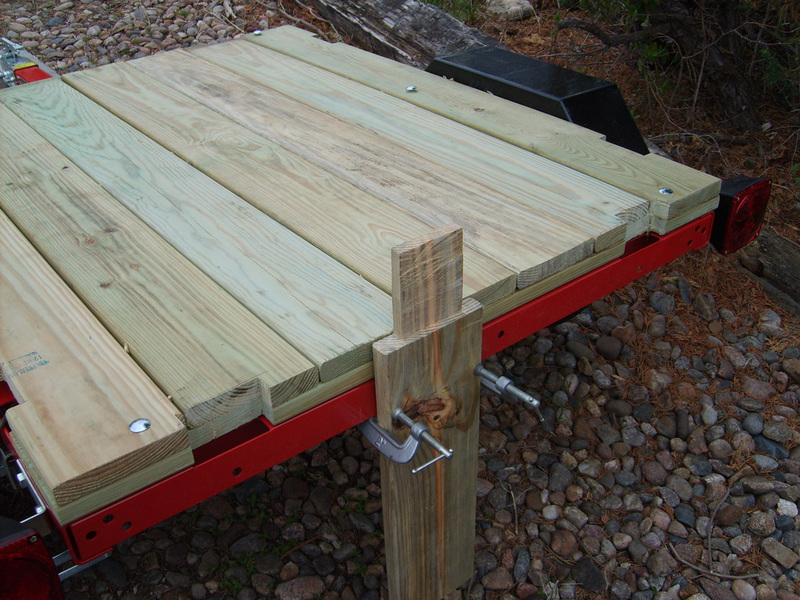 The floor is attached to the trailer frame with nine carriage bolts. 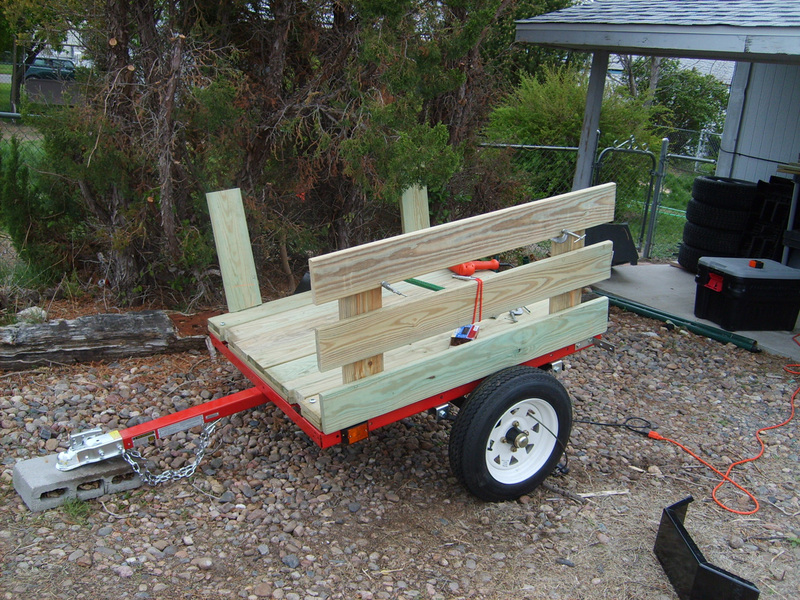 The trailer is designed to use 1"x4" stakes but I'll be using the same boards throughout. Walls will be three horizontal boards with a 2" gap between them, so 20.875" high from the frame and 18.875" from the floor. I'll have fold-down gates at front and back and a canvas cover. I want to be able to use it as a motorcycle trailer later on. Instead of bolting the fenders to the frame, I may connect them to the wooden walls with four bolts each. This would widen the fenders by 2" which might initially look odd, but if I will most likely be swapping out to a heavier axle and larger tires after the trip. For tools, straps and bungee cords, I want to bolt two .50 cal ammo cans to each fender, one on the horizontal and one on the rear slope. In front of the fenders, I'm looking at welding up brackets for fuel and water cans. I got called in to work last night and now have a splitting headache. I got up this morning, intending to go out and enlarge some of the stake pockets that are a bit too small, but didn't get much done. I'm holding the floor down with six bolts as I can't drill the front and center holes without removing the tongue. Six is probably plenty. The pockets along the sides are fine, but the ones to front and rear need to be opened up. 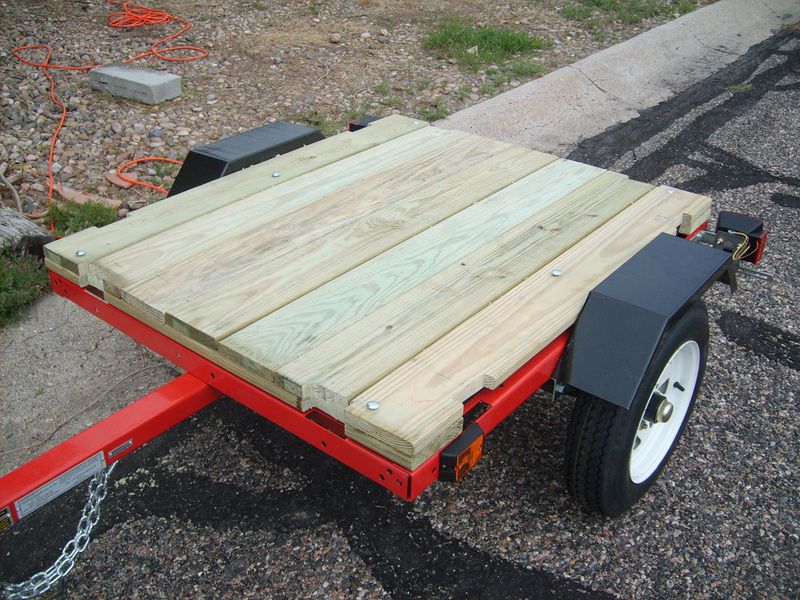 With a 2" drop receiver, the trailer sits fairly level. The trailer is definitely small. Track is pretty narrow too. 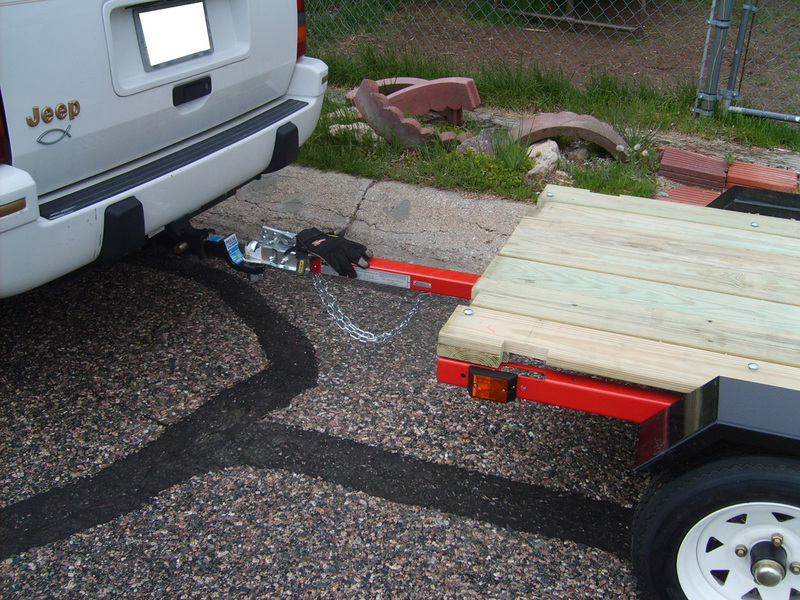 You'd be surprised how tough those little trailers are. I built one 20 years ago with the smaller "wheelbarrow" tires. general hauling before finally toasting a hub on the trip back west years later. It got retired to use behind a quad at the ski club I worked at and as far as I know, it's still rolling. I had a 1/2" plywood box on it and I never ran into any frame problems. I trimmed stakes for the side walls, narrowing the tenons to 3 1/2" and thinning them to 3/4". While the tenons for the side walls are centered, the ones for the front and back will be offset. So far, this part has been the most annoying. I took the left fender off to mount the lowest board. It will have to be trimmed to the same profile as the fender to clear the tire. I had planned on a 2" gap between boards, but increased it to 3" instead to gain a little more height. I have a 4x8 that has worked for 8 years, even on salted roads. It's showing it's age but I will strip it down, wire brush it, then a coat of Por-15 to seal it up for a few more years of use. I grease the wheel bearings. I want to get one of those small ones to go behind the CR-V. One thing I want to change is to put some taller brackets on to raise the lights. They will help with viability and keep morons from running into them. Stiffing the fenders is a good idea, because someone either steps on them or sits on them. Currently, the horizontal boards are screwed to the verticals using 1 5/8" deck screws but I may find myself swapping those out with short bolts. 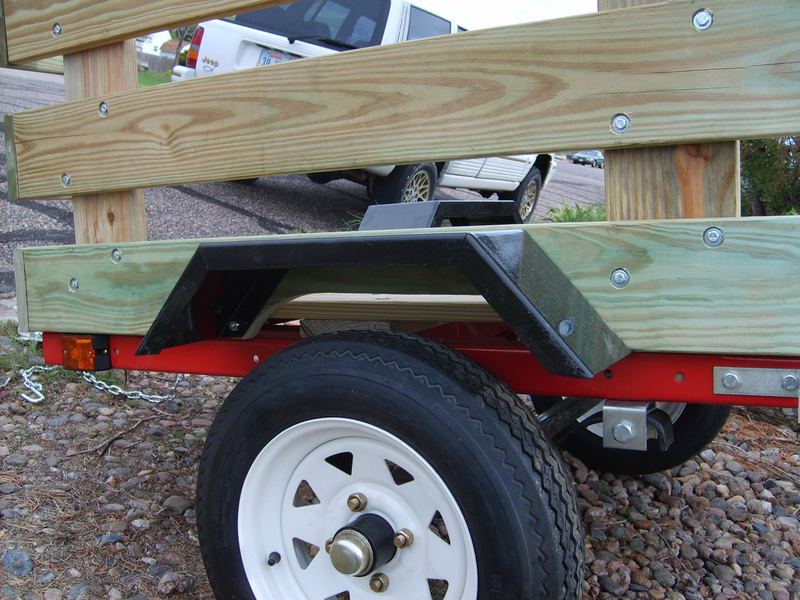 The fenders will be bolted to the lowest horizontal board with four bolts instead of being bolted to the frame. I ordered two .50 cal ammo cans this morning and am going to test them out on the back side of each fender. I'll end up cutting the handles off the lids to reduce rattling, and I'll need to modify the cans for locks. I'll need to leave a small space between the ammo cans and the wooden walls so that the canvas tarp can slip between them, but I might be able to get one or two bolts between the ammo can and the wooden wall. You're sure doing a nice job on that trailer! Certainly a lot better than the manufacturer ever intended to be done with their trailers. I have a similar 4x8 1,000lb. trailer thought I bought used over 15 years ago. I've put so many miles on it hauling so many overweight loads, and it's taken all that abuse in stride - with a more poorly constructed floor and stakesides than yours. The only problem I ever had was when we loaded it up with the back-half of a Samurai (literally cut in half from the back of the doors rearward, frame, body & all - to be turned into a half-Samurai trailer) the frame bent a bit right where the half-Samurai's tires were resting all of their weight. It was easy to straighten it back out (it's stamped steel) and reinforce it - fixed it to be better than new. So after years of abuse, mine's all beaten-up and haggard, but it works great and has never let me down. That was the best $175 I ever spent! I'm sure you'll get years of good service from yours. 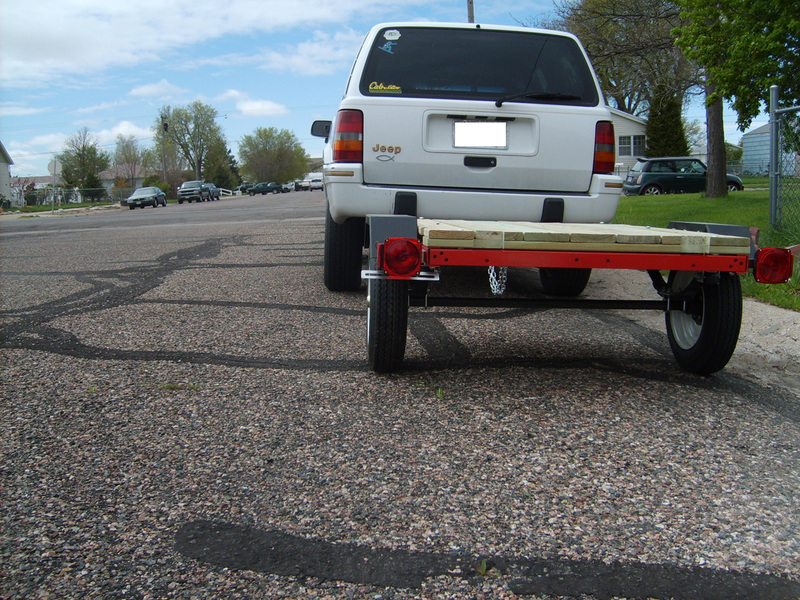 Make sure you keep your wheel bearings well greased, and keep a spare tire with you - trailers are notorious for consuming tires! 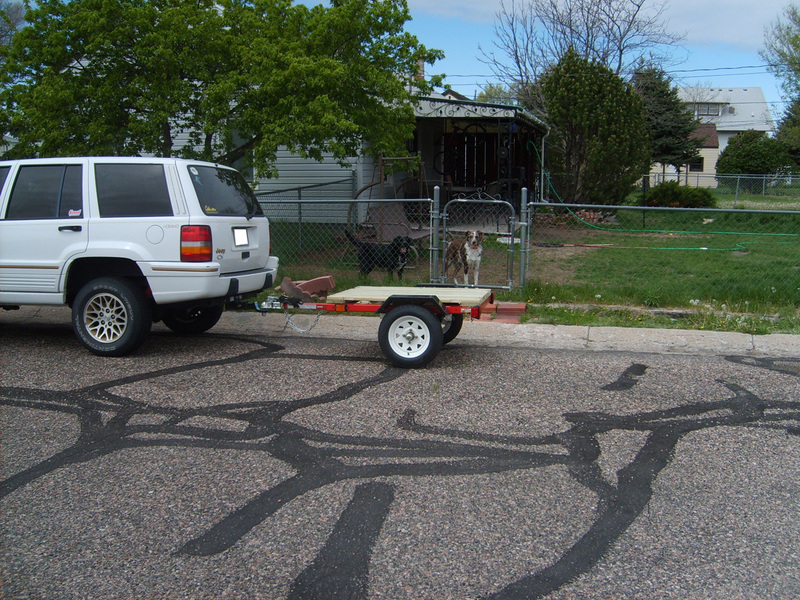 For about 10 years I had the 4 x 8 HF trailer. Great little trailer for what it was. But, my advice.. get spare axles and a hub from HF and carry it around you. Not that I ever had any problems ( my father did with his ) but parts are kinda hard to find on a weekend. The only bad part about HF trailer is that they have some funky hub size that you cannot buy bearing buddies for. I had a machine shop turn down a set for me and pounded them in. Remember those little tires are turning twice the speed as your Rig. I assumed these did the same thing as proper bearing buddies, and fit either the 4-lug or 5-lug HF hubs. I've been wrong before though, no personal experience here. I got mine for christmas about 6 years ago and they were not any sort of standard size. Hopefully they have upgraded them to a standard size? Visibility is poor from the drivers seat when backing a small trailer. 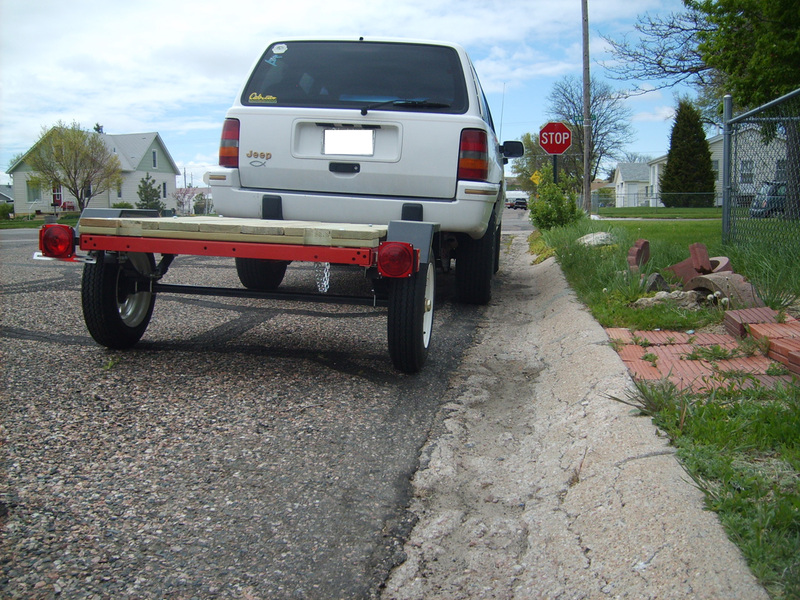 A section of 2" +/- white PVC pipe as a rear bumper can be cut to a length that is visible when the trailer starts to turn off line. Sure helps, and adds a little visibility at night too. I need to look into Bearing Buddies. I saw the same sort of thing for sale at Wal-Mart and another at our local Merchantile. Said that it fit two sizes of axles. I'll have to measure and see. Just how much grease am I supposed to pump into these things? How do I know when to stop? The bearings came packed with some kind of light tan grease and I cleaned them up a bit and packed them with red Timken grease. Only problem is that my grease gun is loaded with a black bearing grease I use in the tie rod ends of my Jeep. Does mixing different kinds of bearing grease cause a problem? 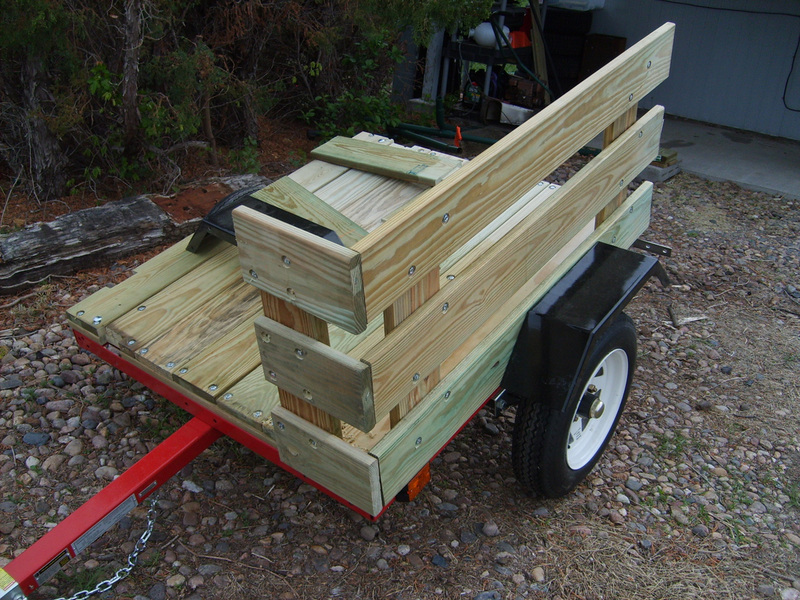 I have never used bearing buddies unless it was a boat trailer(pushes the water out of the hub). think of the front wheels on a rear wheel drive vehicle... how often do you worry about them? I have more done, but I'm far from being done. It has rained every day for the last four days. Yesterday, I went out to take some measurements and mark some prior to cutting them this weekend, and found that as the treated lumber dries out, some are beginning to split. My first thought was to try to smear wood glue down in all of the cracks. I ended up going over all of them with polyurethane to try to kind of bond everything together. I also found that on the floor, some cupping was occurring, so decided that 1 5/8" deck screws are not going to be enough to hold it all together. This morning, I bought $55 worth of bolts, and so far have replaced half of the screws. Tomorrow, I hope to get the other side assembled, so it's at least symmetrical. I'll have to do some trimming to get the tail lights to fit again, or make a spacer to move the lights out a bit. I received two .50 cal ammo cans that I'll mount on the left fender. One on the rear of the fender and one on top of it, each with a 3/4" space between the can and the fender. I don't have a spare tire yet, but hope to solve that before I go on my trip. The trailer will have gates front and back but I'm still trying to work out exactly what that is going to look like. 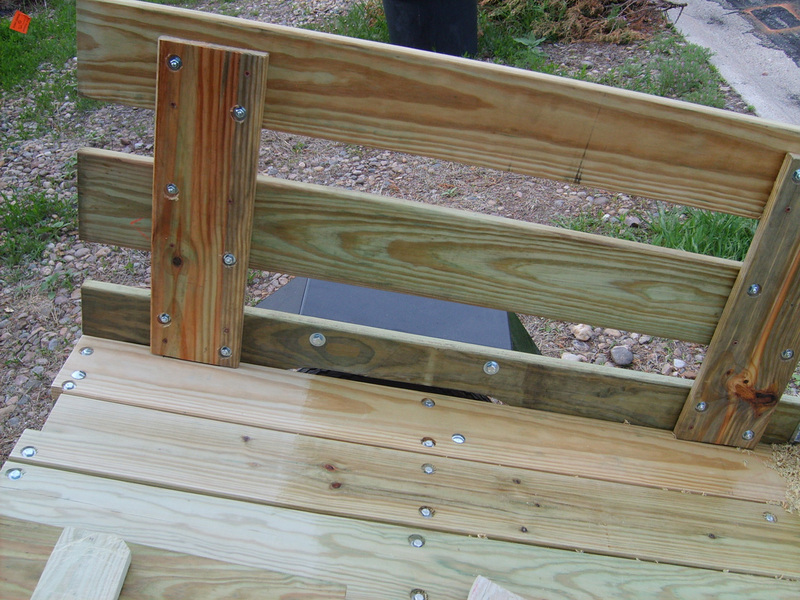 The fenders are mounted on the lowest wall board instead of to the frame. 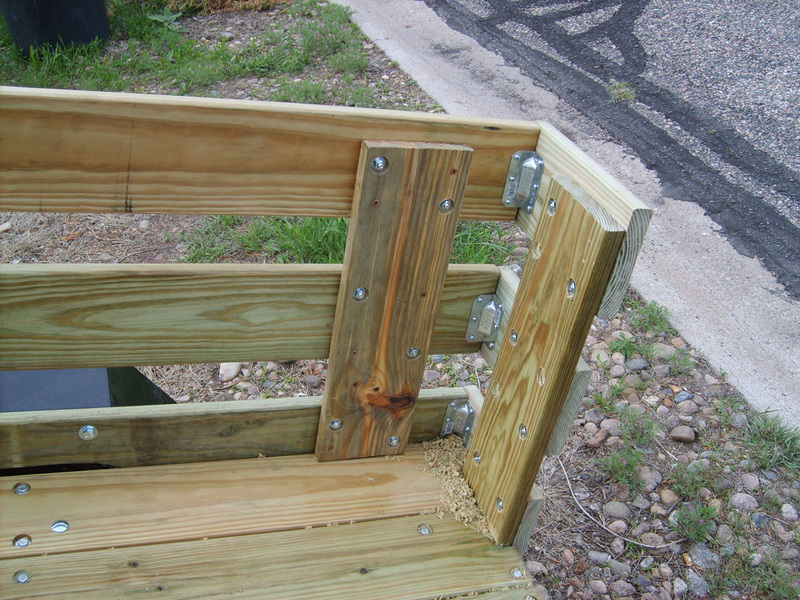 The inside corners are secured with these brackets. I've not yet decided if I'll put brackets on the outside corners. The fenders are raised about 2" and moved outward 1". I cut a 2 1/2" high section out of the lowest board to allow more clearance, but it does create a gap for the cargo box. I may try filling that gap with something, maybe a strip of aluminum.